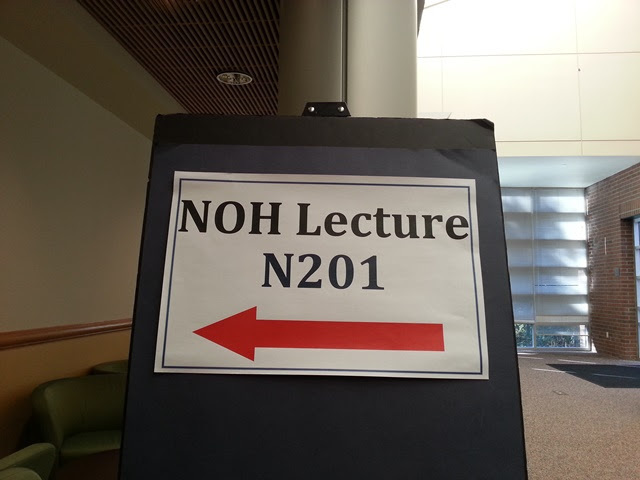 On September 6th and 7th, Noh lectures and workshops were held at Aki Matsuri in Bellevue, Washington. The events were presented by Richard Emmert, Professor of Musashino University in Tokyo and Artistic Director of Theatre Nohgaku. 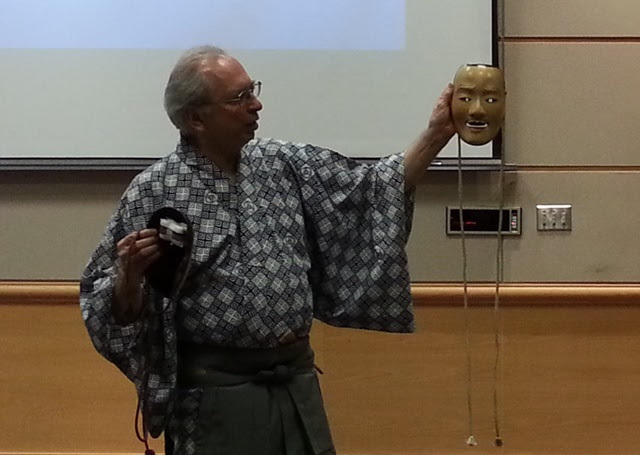 Professor Emmert began studying Noh in 1973 and is a licensed instructor in the Kita School of Noh. He has translated many classic Noh plays into English and has also held performances in English. Noh's origins date back to Japan's Nara Period (710-794 A.D.). Though, most plays performed today are slightly more modern. The famous Noh playwright, Zeami wrote over 50 plays during his life in the late 14th and early 15th century, and many of those plays are still performed today in their original format. 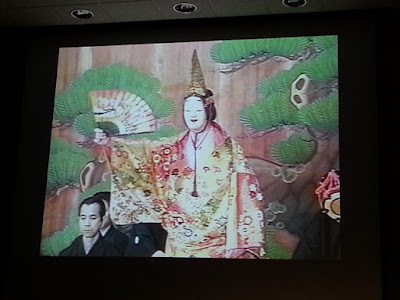 The Noh lecture began with a performance of Matsukaze (Wind in the Pines), which centers around the ghosts of two sisters who died from grief upon learning of the death of the man they loved. This dance was performed twice, once while being sung in the original Japanese and again while being sung in English. I was really struck by how closely the English intonation matched the Japanese, so much so that I didn't immediately realize I was hearing it in English. 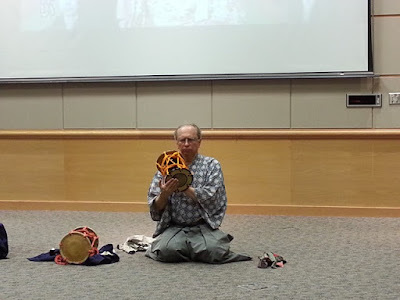 Professor Emmert had the somewhat difficult task of not only dancing on carpeting (Noh stages are smooth wood, ideal for the gliding steps of the dancers), but also dancing while singing. Noh performances will have up to 15 people on stage, most of whom are musicians who would be singing Matsukaze's lines while the actor dances. Next, we learned about kamae (posture). One of the more unique elements to Noh dance is how the actor tilts forward slightly at the waist with their hips pulled back. This helps to negate the sway and bounce of a natural upright walking movement, keeping the upper body still while the legs and feet propel the actor forward. With this posture, the actor's weight is put forward on the balls of their feet and they move with suriashi (sliding feet), gliding forward while raising their toes at the end of each step. 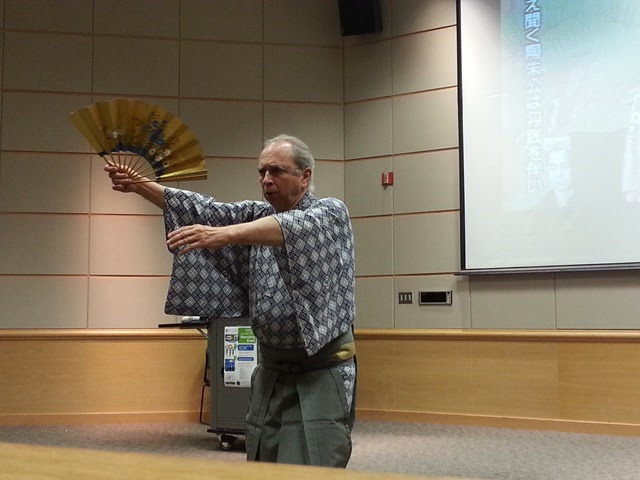 At the same time, the actor's arms are bent out slightly at the elbows which helps to better display their elaborate kimono. 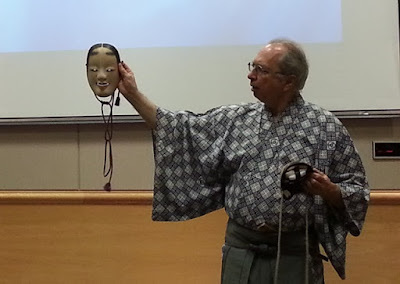 Some of the movements you will see in a Noh play are shikake (fan is held out at shoulder height), sashi (pointing downward with the fan) and a gesture where the hand is brought up to the mask, signifying crying or wiping away tears. 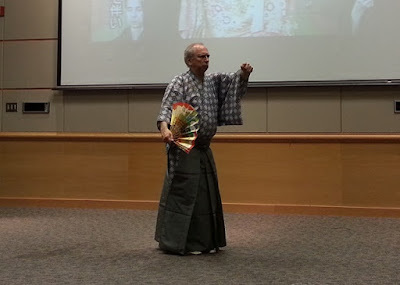 Unlike Kabuki and Nihon buyo which use movements to describe actions and surroundings, the movement in Noh is not necessarily meant to describe anything. Where a Nihon buyo performer might use their hands to suggest the shape of Mount Fuji, a Noh performer may simply point into the distance with their fan. In Noh, you are seeing the character admire Fuji-san, but you are not seeing Fuji-san itself. We were also introduced to two distinct singing styles. Wagin is a soft, melodic singing style that Professor Emmert used while performing a shimai (short dance) of Yuya. Gogin is a more dynamic singing style where the pitch is less clear. This style is most often used in warrior plays such as Yashima. Interestingly, most warrior plays in Noh are set around the time of the war between the Genji and Heike (Minamoto and Taira) clans, which took place in the early 12th century. Next, we were introduced to the key musical instruments in Noh. 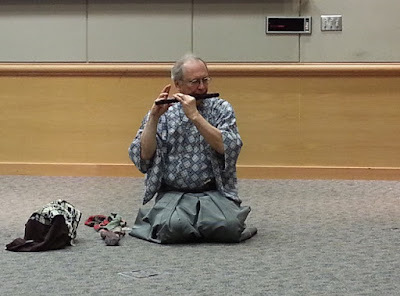 The Nohkan (fue) is a Noh flute similar to the Ryuteki (dragon flute) used in Gagaku (court music). The Nohkan is made of bamboo and has an additional pipe inside, allowing it to deliver the otherworldly sound that is unique to Noh. 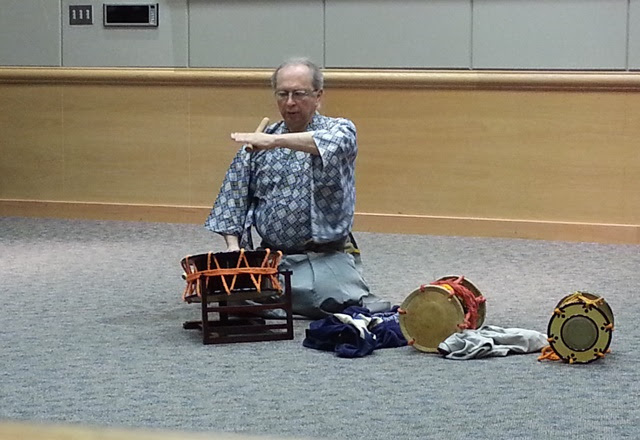 The Kotsuzumi (small drum) delivers a round, echoing sound that can be adjusted by gripping and tightening the strings along its sides. The Otsuzumi (big drum) skin is heated to remove moisture, creating a very hard surface. Musicians will typically wear hard sheaths like long thimbles made from paper over their fingers to protect them when they strike the drum, as well as to add to the sharp popping sound they create. Taiko drums are used slightly less, but are no less important. 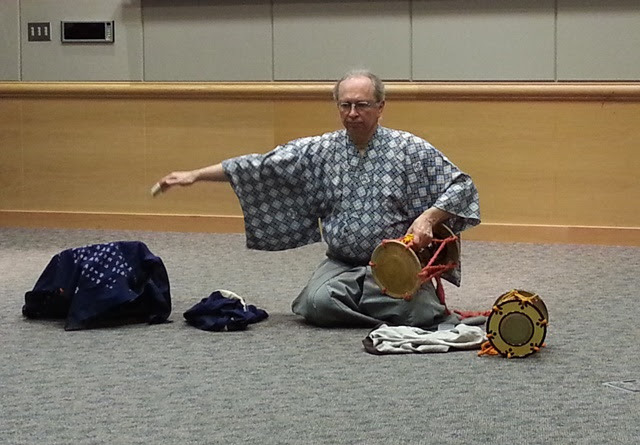 Drumming is accompanied by kakegoe (thrown voice) drum calls that are part of the signature Noh sound. 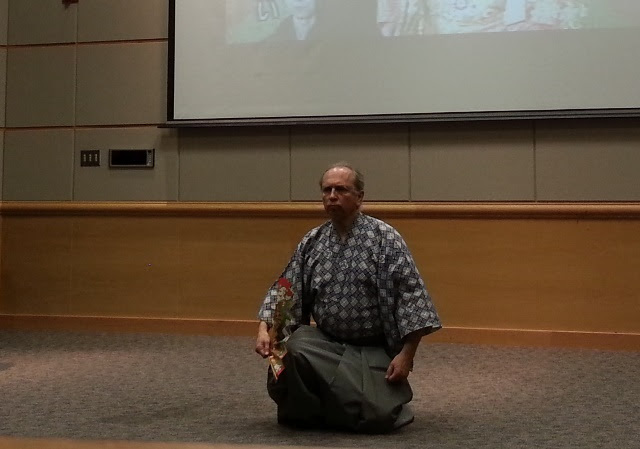 Nearing the end of the lecture, we watched a video of Funa Benkei performed by actors from the Kanze School. While the core movements of Noh remain the same, there are subtle differences in style between schools that a casual observer like myself might be unable to discern. Seeing Funa Benkei was a special treat for me because this was also the first Kabuki play I had seen. Even in Kabuki, with its slightly more modern style, Shizuka's farewell dance is still performed in Noh style. Seeing Yoshitsune battle the ghost of Taira no Tomomori at sea is still as impressive in Noh as it is in Kabuki. The lecture ended with a viewing of two Noh masks, the Komote (young woman) and what I believe is the Kantan otoko (young man). Thanks go to Professor Richard Emmert for sharing his knowledge and insight into Noh and to Japan Arts Connection Lab (JACLab) for making this event possible.